Photography changes and evolves all the time, and it was no different back in the 1800s. Wet plating was one of the first ways to produce pictures in the 1850s and continued for nearly a decade before it was replaced by a process that involved silver-plated copper, mercury vapor and many other steps as well as different types of plating. 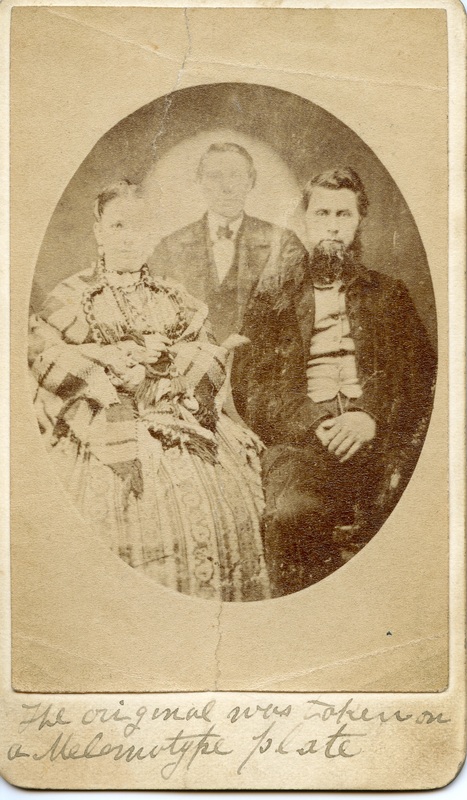 Near the 1880s, when the spirit photograph currently owned by the museum was created, this had been largely replaced by the use of gelatin dry plates. The fact that these pictures were taken on these plates is key to knowing where many spirit photographs originated and how many of them were created. These plates had to be cleaned between each use so the previous picture would be removed from them before they could be used again. The improper cleaning of these plates could easily result in a figure, or ‘spirit’ appearing in the photograph that is taken with the plate. This, however, is just one of the ways that a ‘spirit’ could appear in photographs of that time. The photograph available at the museum shows a fairly obvious man sitting behind two other figures within the image. By the position of the man he seems as if he would be sitting behind the two and higher up, or perhaps even floating in the air. He is somewhat transparent and it looks as though his torso below the top of his chest fades out of sight and does not exist afterward. Because this picture was taken by Ebenezer himself, he seems excited and highly interested in how these come to be and shares this with his father in hopes that he will share his passion. Thomas, however, does not share his enthusiasm for the picture and tells his son quite plainly what he believes. He sees the picture as something of the Devil and that it is connected to ‘falling away from God, and disbelieving his word.’ He continues on and mentions several different sections of the Bible which speak against the idea of spirits (or ‘familiars’ as they are called) and what has happened to those who have put faith in such things. 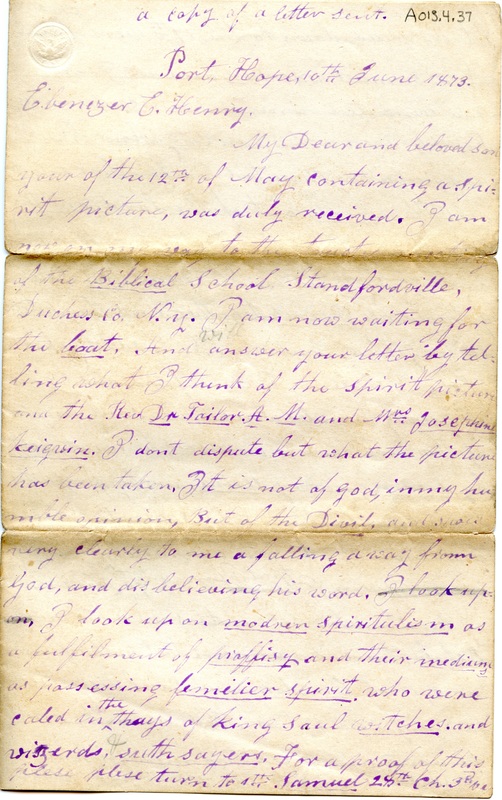 When he receives pamphlets containing more information, again sent by his son in regards to the photograph, he proceeds to take them apart and ‘disprove’ them by citing more scripture. Personally, I have always had an interest in these sort of items. Ones linked to the paranormal have always caught my attention and something like this is absolutely no exception. It may even be more interesting to me because of the time period in which it was taken. Spirit Photographs were being heavily disproven in this time frame and to see someone who has taken one without knowing how or what could have caused it, and their genuine reaction of interest and intrigue, is refreshing to see. 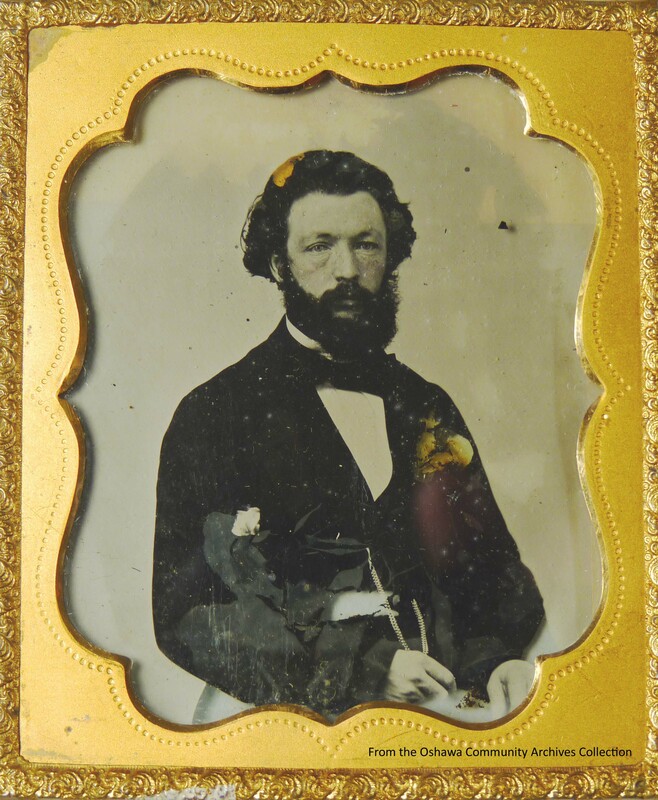 It’s the history behind this item, the story that comes from it, and the general idea of it being such a novelty to someone when the use of Spirit Photography had been around for some time, since the 1860s according to several sources. Still, this picture was a first for Ebenezer, and possibly a last considering the reaction he received from his father. All of this, coupled with the idea of the paranormal as well as the quality of the image itself, helps cement this item as being my favorite in the collection. This entry was posted in From Our Collection, From The Archives and tagged Archives, artifact, EE Henry, Henry Family, Henry House, Heritage, Historical, History, Local History, Museum, Oshawa, Oshawa Community Archives, Oshawa Community Museum, photography, Spirit Photograph, Student by oshawahistoricalsociety. Bookmark the permalink. Reblogged this on Leavenworth County Historical Society.